For decades, hardworking taxpayers have been fleeing slow-growth states that permit the firing of employees for refusal to bankroll an unwanted union and relocating in faster-growth Right to Work states, where such firings are impermissible. Considered as a group, the 23 states that still lack Right to Work laws are now on track to lose roughly $200 billion in income to domestic out-migration from 2010 to 2020, or 30% more (in constant dollars) than they lost from 2000 to 2010. “What will it take,” asked National Right to Work Committee President Mark Mix, “to convince elected officials in forced-unionism states that are economically torpid or unaffordable, or both, that their current policies governing labor relations aren’t working, and need to be changed? Thanks to data furnished by the Statistics of Income (SOI) division of the IRS, it has for many years now been possible to calculate the sum total of wages, salaries, and other income taxpayers take with them when they flee forced-dues states. The SOI division records the number of personal income tax filers who move (typically with their dependents, if they have any) across state lines, based on address changes shown on their tax returns. The SOI data are arranged according to the year taxes are filed. For example, the most recent available annual data (for the Tax Filing Year 2016) show that a total of 1.78 million tax filers were residing in a Right to Work state that year after residing somewhere else in the U.S. the previous year. (Since the ban on compulsory union dues and fees in Kentucky, the most recent state to enact and begin enforcing a Right to Work law, was not adopted until the beginning of 2017, it is regarded as a forced-dues state in this analysis. Meanwhile, roughly 1.60 million tax filers were residing in a Right to Work state in 2015, but filed from somewhere else in the U.S. in 2016. That means a net total of roughly 180,000 tax filers moved from a forced-unionism state to a Right to Work state between 2015 and 2016. The SOI division also calculates and makes public the aggregate adjusted gross incomes for tax filers in the year immediately following their move from one state to another. Personal income tax filers moving out of a forced-unionism state between 2015 and 2016 reported a total of $128.8 billion in income in 2016, or $75,958 per filer. Tax filers moving into a forced-unionism state reported a total of $104.5 billion in income, or $68,763 per filer. Both because of their substantial taxpayer losses due to net domestic out-migration, and because the taxpayers they gained reported nearly $7200 less income apiece than the tax filers they lost, forced-unionism states lost a net total of $24.3 billion in adjusted gross income in a single year. 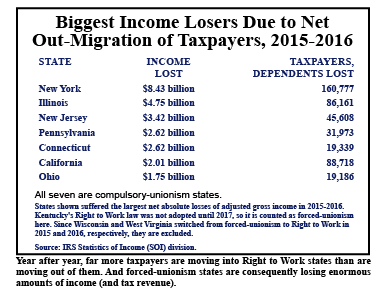 Moreover, all of the seven states (New York, Illinois, New Jersey, Pennsylvania, Connecticut, California and Ohio) suffering the worst losses of income, in absolute terms, due to taxpayer out-migration from 2015 to 2016, lack Right to Work laws. Over the past five years for which SOI data are available, compulsory-unionism states collectively lost a total of $96.3 billion (2017 dollars) in adjusted gross income. And the migration data furnished by the IRS indicating a loss for forced-dues states of approximately $200 billion over the course of this decade do not convey how much taxpayers who flee forced-unionism states earn any later than the first year after they depart. The financial cost endured by Big Labor-ruled states actually compounds and recurs, year after year. The accumulated net loss from 2010 to 2020, including income reported by taxpayers in all years subsequent to their migration, cannot be calculated, but will very likely be at least four times higher than what the IRS data reveal. State Right to Work laws protect employees’ freedom to refuse to pay dues or fees to an unwanted union. Wherever employees lack this freedom, union bosses have little incentive to tone down their class warfare in the workplace. Employees are consequently far less likely to reach their full productive potential. “Compulsory unionism is wrong, plain and simple,” affirmed Mr. Mix. “The union-label politicians who regularly get elected and reelected because of Big Labor’s forced dues-funded support overwhelmingly favor higher taxes and more red-tape regulation of business. “According to state Senate President Steve Sweeney [Gloucester], who himself is an active ironworkers union boss as well as a public officeholder, New Jersey faces at least $222 billion in long-term government pension and unfunded post-retirement medical liabilities. “And over just the next four years, Mr. Sweeney declares, the amount of taxpayer money that’s required to be paid annually into the government worker pension system will more than double, from $3.2 billion to $6.6 billion. 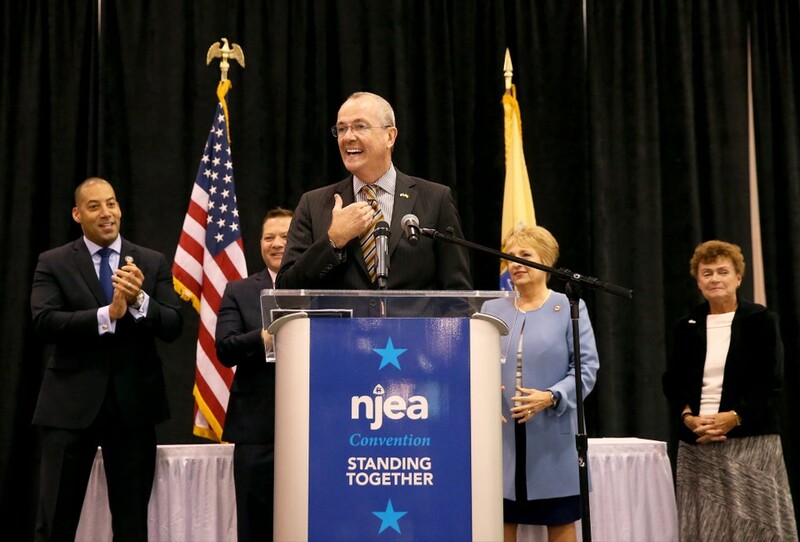 Big Labor Garden State politicians like current Gov. Phil Murphy have tried again and again to replenish government coffers by hiking taxes ever higher, but such maneuvers only succeed in driving away additional taxpayers, as the IRS’s SOI data show. “Before it runs out of taxpayers, New Jersey will have to face the facts and change course,” reasoned Mr. Mix. “And one reform that is absolutely indispensable for a return to solvency is enactment of a Right to Work law prohibiting the termination of employees for refusal to join or pay dues or fees to an unwanted union. “Decades of experience show that it is effectively impossible to break the cycle of ever higher taxes and government spending as long as a state’s Big Government politicians continue being propped up by the forced dues-fueled union political machine. “In fact, according to the most recent analysis conducted by the nonpartisan, Washington, D.C.-based Tax Foundation, state and local taxes combined consume a 25% higher share of personal income in jurisdictions where the Right to Work is not protected. “Today, it may seem like the political opposition to Right to Work in union boss-controlled states like New Jersey is insurmountable. But New York, Illinois and New Jersey can’t continue hemorrhaging taxpayers forever.